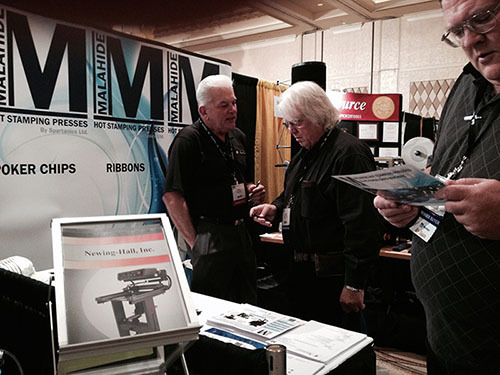 ROLLING MEADOWS, IL, USA – March 1, 2014 – Spartanics unveiled their latest hot stamping product line, Malahide by Spartanics, to the award ribbon, poker chip and promotional item industry at the 2014 Award and Recognition Association International Awards Market Show in Las Vegas, Nevada. For 3 days, Spartanics performed live demonstrations of the new and improved Malahide by Spartanics E2-TR Ribbon Hot Stamping Press. The Malahide by Spartanics E2-TR Ribbon Hot Stamping Press is a fully automatic, multi-color ribbon printing system that can achieve speeds of up to 7,2000 ribbon printing impressions per an hour. This all electric ribbon hot stamping system is most commonly used to hot stamp award ribbons, gifts and packaging items, rosette components and a variety of other narrow web textiles and tapes.